In the﻿ interest of keeping in the holiday spirit, I can't help but write about my fervent appreciation for pine cones when it comes to holiday decor. Santa and snowmen aside, nothing says 'deck the halls' like the reproductive system of coniferous trees. My living space is limited, so I opted to decorate sans tree and incorporate other pine-laden elements. 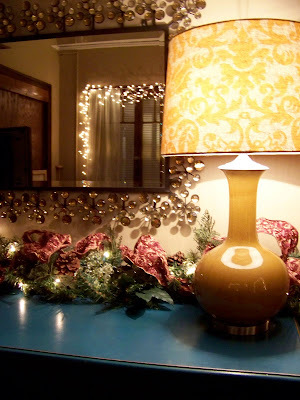 I used a full garland wrapped in white lights for my turquoise buffet, the focal point of the room. The garland was softened with champagne-colored glass beads and a textured taffeta ribbon embellished with small rosettes. Adding ribbon to garland can be a delicate task. 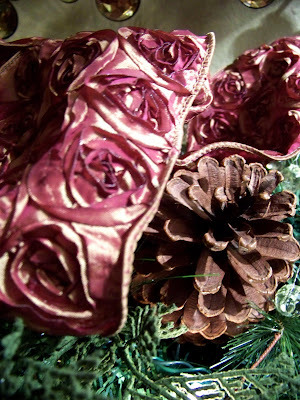 When adding ribbon to a garland it's key to remember to sporadically gather and tuck around the pine cones in an effort to keep a balanced look. Once finished, I slapped some lights on the windows, tossed some ornaments here and there and bada bing bada boom I was set. Although my style tends to gravitate more towards an eclectic look, I certainly have an appreciation for clean lines in holiday decor as well. 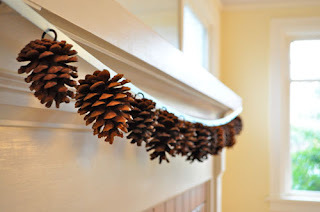 This week I stumbled upon another DIY pine cone garland of interest with cleaner lines that would look stunning in any locale. This garland, for example, is a simple garland made of ribbon, screw hooks and pine cones (I have been known to take the same approach in making pine cone earrings, but that is a whole other post). Screw the hooks into the pine cone and attach where you see fit. Simple, elegant and thrifty. And if you really wanted to shake things up, add paint or glitter. Pine cones can also look tasteful hung by a ribbon from pine garland. An easy way to dress up a window, banister or mantel. These little guys are so versatile that you can de-glitz them from the holidays and transition into winter decor. You're sure to get some 'oohs' and 'ahhs'!